The LAVINA® 30G-X is a forced belt-driven planetary machine, featuring three 13.5-inch heads and a low profile base for reaching beneath shelves and cabinets. 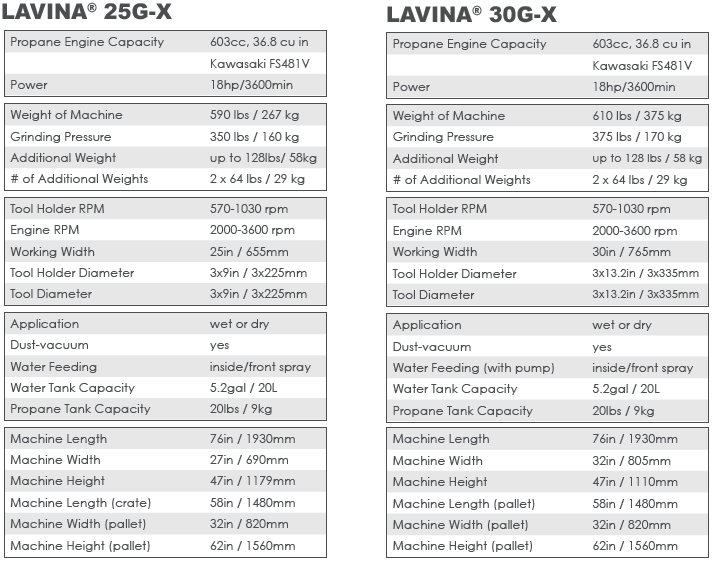 When ordered as a LAVINA® 25G-X (25-inch model), the machine has three standard 9-inch heads without the low-profile base. Propane means faster, cordless work! Perfectly balanced for constant control and safety. May be used wet or dry, and should be accompanied by our standard line of recommended tooling (QuickChange, NATO, V-HARR, Calibra, etc). Click the button below to add the Lavina 25GT-X and 30GT-X Propane Grinders to your wish list.